This December, my fellow Director James Feng and I visited Kilinochchi in Sri Lanka, a region that was badly affected by nation’s 25-year civil war(1983-2009). The main purpose being to connect with our latest grassroots partner organisation, Kaveri Kala Manram (KKM), and our partner community for our latest project. James and I travelled to Kilinochchi by bus (6 hours). Having visited this town a few times in the immediate aftermath of the war, it was heartening to observe that this town has developed a fairly bustling town centre. KKM, however, work with communities in more rural parts of Kilinochchi. Sadly, stories of displacement, loss of loved ones, and disability (especially due to landmines) are part of the fabric of post-war life in regions like this. While ostensibly clustered into ‘villages’, the reality of resettlement is that not all households are in their traditional homelands. A fact that could have a significant bearing on the level of cohesion and collaboration between households in the area. As emphasized by staff at KKM, widows are often among the most marginalised – often struggling to support their children. They are often ostracised by the wider community on account of being poorer. I was told that this is also because these widows purportedly turn to prostitution out of desperation to provide for their families. It is in response to this situation that our partner KKM aims to enhance the livelihoods of women-headed households (particularly widows from the war). This is complicated by the fact that Kilinochchi is in Sri Lanka’s dry zone. Therefore, KKM’s approach involves providing households with tube-wells and drip irrigation as a starting point. In addition to improving household wellbeing in terms of health and sanitation, this agriculture a viable option. This is then followed by extensive training in organic agriculture, and market linkage for their produce e.g papaya, cassava and coconuts. This intervention has been successful in terms of providing households with an additional stream of income. In fact, for many, it is now their primary source of income. Kamachi’s story (see below) is an example of this. a) Providing all households with drip irrigation technology and training on use. b) Training in organic cultivation + the provision of seedlings for a range of fast-growing and long-term cash crops. c) Establishing a cooperative with a revolving credit facility. The latter will allow women to access affordable credit to improve their livelihoods and address any vital expenses e.g. health or education related expenses. Having met with women from the region, it is clear that KKM has an impressive track record in helping them transform their lives with dignity. The fact that KKM are so highly localised, hiring and training staff from the area, really allows them to have a strong grasp of local needs and build strong realtionships. 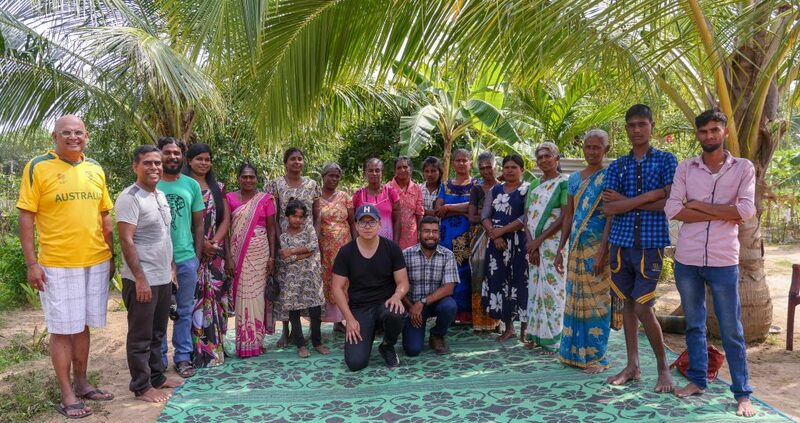 For us, this project is also strongly aligned with our values – namely our commitment to women empowerment, to collaborative models, and ecologically sustainable practices. We are very grateful to the Vasudhara Foundation and the Lak Saviya Foundation for funding this initiative. Should our evaluation of this pilot suggest that it is effective, we hope to scale this model to reach more women in the region. James and I are very grateful to the Vanni Hope/KKM team for their generous hospitality. It was wonderful to meet in person after so many digital exchanges (email and Skype). We left with a great sense of hope and excitement. This project goes lives in January, we will be sure to post plenty of updates from the field.